Odd Fish With A Bird-shaped Head Raises Debate In Internet. A bizarre-looking fish has become viral on the internet in China because of its unusual ‘bird’ looking head. The head of the fish looks like a pigeon’s or a parrot’s head, but many others argued it bears more resemblance to that of a dolphin. This fish is actually a grass carp and this species are available in Asia. One of the local fishery expert says, "The strange creature is a deformed carp." Some of the web users called the creature,‘bird fish’. Here in this video, you can see the odd fish gasping on the ground. While its body looks like a normal fish’s body, its head has a distinctive, mismatched shape. The video has been circulating on Chinese online forums as well as on Facebook that leaves the web users debating over what the creature really is. The shaped of the fish’s head is like a pigeon, parrot or dolphin that have been commented by many locals. 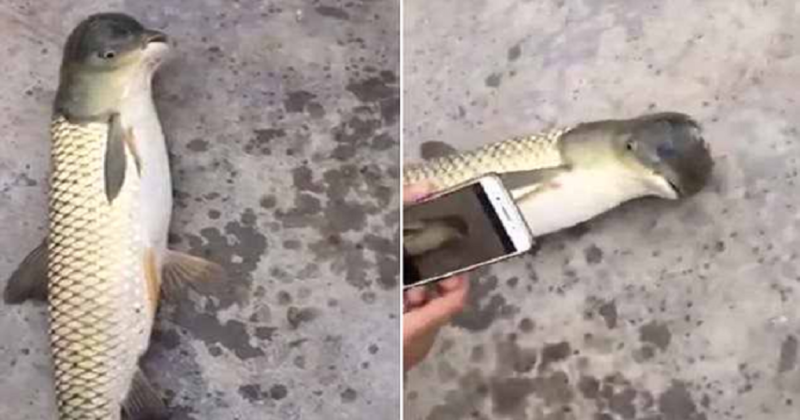 One Facebook user, called ‘Hong Fang’, questioned: ‘Is this a cross-breed of carp and dolphin?’ While another Facebook user ‘Duan Yiching’ said: ‘It looks like a radioactive fish to me.’ This is actually nothing but the unusual growth of head.